Last weekend we went to a local pizza restaurant that supposedly has the “best” deep dish pizza outside of Chicago. I hate deep dish pizza. I like my pizza thin and crisp – the way it should be! But I agreed to go (kicking and screaming all the way). The things I do for the people I love! The interior was appealing and the staff was friendly, although they may have the most uncomfortable booths that I have ever graced with my rear. Lulled by the well decorated restaurant and free flowing soda, I thought, “Hey – this deep dish adventure might not be half bad”. Of course, I would did not utter this out loud in fear of having my earlier objections rubbed in my face. I opened the menu and was pretty excited because a.) they had flaming cheese and I’m all about cheese and flames b.) they had flatbread pizzas… Score! I decided on a Mediterranean flatbread because feta cheese makes me a happy girl (see, I told you I have a thing for cheese). Well, I was no longer in anti-deep dish pizza restaurant mode until my flatbread appeared at the table. Although I was suspect from the moment is was placed on the table, I went against my better judgement and actually took a bite. Now, the toppings were fine. You can’t really mess up olive oil, feta and some herbs. But, oh my goodness, the flatbread was a hot mess! In a blind taste test, I truly don’t think I would’ve been able to tell the difference between that flatbread and a piece of cardboard topped with feta cheese. Not good, not good at all. When I got home I was determined to find a recipe that was not only simple (I kind of have a minor yeast phobia), but also amazingly delicious! I turned to Artisan Bread in Five Minutes a Day and found a pizza dough recipe that’s so good, it’ll blow your mind. This olive oil dough recipe is ridiculously easy to make. So easy, I questioned if I had skipped a step! It is rich, full of flavor and perfect for pizza dough and focaccia. It also makes a lot of dough, but the beauty is that you can store the leftover dough in the fridge for up to 12 days and use it as the urge strikes. Trust me, after your first flatbread, you’ll have a new habit and it’ll be used up in no time! Just FYI, I’m obsessed with flatbread now. Stay tuned for posts that highlight this recipe from Artisan Bread in Five Minutes a Day for pizza dough perfection. 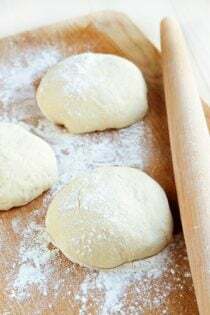 In the bowl of your stand mixer fitted with the dough hook attachment, or in a large (5 quart) bowl working with a wooden spoon, mix the yeast, salt, sugar, and olive oil with the water. Mix in the flour without kneading. I found this process to be incredible simple with my stand mixer, but it will certainly come together the old fashioned way. If you are not using a machine, you may need to wet your hands in order to incorporate the bit of flour. Transfer dough to large (5 quart) bowl or lidded food container. Cover (not airtight), and allow to rest at room temperature until dough rises and collapses (or flattens on top), approximately 2 hours.